There’s nothing better than a fun day on the slopes during winter! Whether you love to ski, snowboard or tube – or even if you are new to snow sports – there are plenty of options for winter-y activities around Northern Virginia. The following resorts offer skiing, snowboarding, tubing, lessons and more to enjoy this snowy winter season. Bryce Resort is about an hour’s drive from Northern Virginia – the closest slopes to our area. It’s well-known for their teaching programs, so if you or your kids are new to skiing or snowboarding, this is the mountain for you! Their 800-foot snow tubing lanes also offer fun for both adults and kids (kids must be 4+ and at least 36 inches tall). While Bryce has a restaurant and shop, as well as nearby hotels, there are no on-site accommodations. Whitetail Resort is less than two hours away in Pennsylvania with skiing, snowboarding, snow tubing, lessons and more. While the tubing park is for riders 5+, there is also a kiddie tubing park for riders 2-4 years old. Also, they offer hourly child-care if you want to hit the slopes kid-free. Roundtop Resort is another popular resort just about 2 hours away in Pennsylvania. It offers skiing, snowboarding, snow tubing and lessons. Tubing is for adults and children over 5. They also have a separate kiddie area available for younger riders ages 4 and younger. Plus, children ages 18 months through 12 years old can go to their playcare while the adults hit the mountain. Liberty Mountain Resort in Pennsylvania has skiing, snowboarding, a hotel, and a tavern. It offers several ski packages, lessons, plus a terrain park. For snow-tubing, there are up to 15 perfectly carved lanes you can enjoy day and night, plus Pebble Ridge Kiddie Tubing just for children ages two to four.There is also a full service daycare for kids ages 6 months to 10 years. Massanutten is a popular year-round resort just 2 hours from Northern Virginia. Their activities include skiing, snowboarding, lessons and tubing with both day and night hours. Tubing is for adults and children at least 36 inches tall. They also offer ice skating and dozens of activities daily, including an indoor waterpark with lots of slides, a kid play area and more. 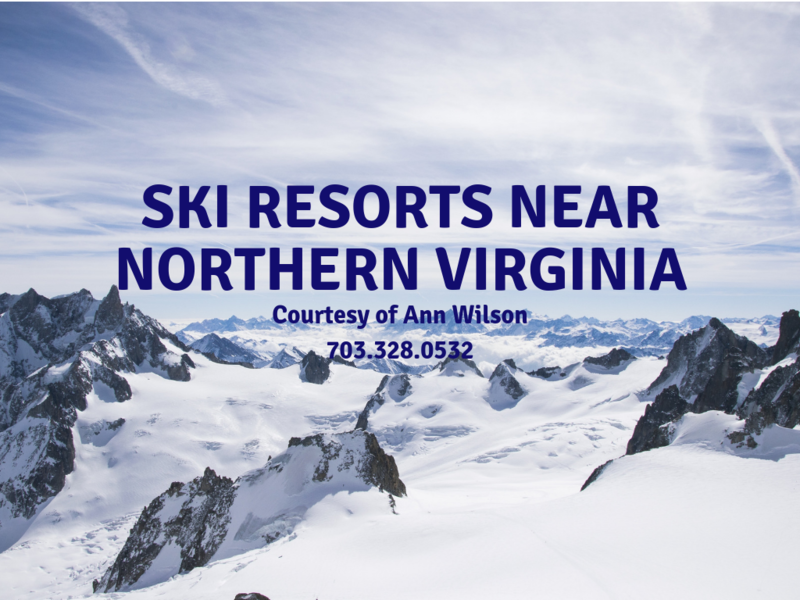 Wintergreen Resort is another year-round resort just under 3 hours from Northern Virginia and offers skiing, snowboarding and snow-tubing. Their tubing park, The Plunge, is the largest in Virginia and is available for adults and children ages 6+ and at least 42 inches tall. For any younger children, they have Ridgely’s Fun Park with a smaller tubing area and more. Timberline Resort is a year-round resort in West Virginia’s Canaan Valley that offer over 40 slopes and two terrain parks, ski school, daycare and more. The slope-front hotel has ski-in/ski-out chalets, condos and homes available to stay in. This resort is nestled in the mountains of western Maryland and offers skiing, snowboarding, and training for both. Its snow tubing park is huge, with 12 lanes that are each 750 feet long; participants must be at least 42 inches tall. The ski-in/ski-out resort also offers accommodations, dining, and shopping. Seven Springs Resort has it all when it comes to a winter getaway. The year-round resort offers skiing, snowboarding and 7 terrain parks. They also have a huge snow tubing park, kids must be at least 42 inches tall to ride. They also have plenty of accommodations and dining available including hot tubs, indoor pools, spas, shopping and more. Snowshoe Resort has skiing, snowboarding, a training school, and snow tubing and more. Here you also can take an off-road Polaris RZR tour into Snowshoe’s back country or rent a snowmobile for a special tour, day or night (children ages 6+ & at least 46” tall can be passengers). The Split Rock Pools have a geyser, slides and indoor/outdoor swimming area and a sauna and hot-tub. Snowshoe also offers child care and lots of indoor fun options.